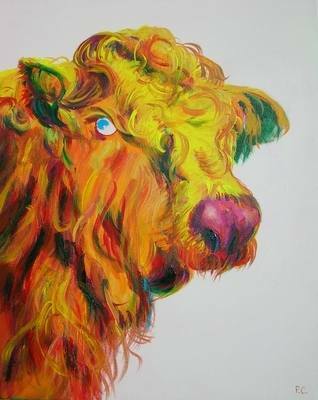 LOVELY ORIGINAL OIL PAINTING "Sweet Moo of mine" BY THE SUPER ARTIST PENNY CLANDON. S.W.A. ............ A beautiful Fauvist cow!! Measurements; height 20 inches by 16 inches.
" An Amazing Blue Chip Investment Opportunity to Acquire an Original Penny Clandon S.W.A Painting" ..
Penny Clandon S.W.A was elected into the Society of Women’s artists some six years ago. Since then she has exhibited six of her pastels at their annual Art Exhibitions at Westminster Central Hall Gallery in London. She has also exhibited at the Society of United Artists’ Annual Exhibition. Other exhibitions displaying her work have been The Pastel Society and The Buckinghamshire Art Society. The President of the Societe des Patelistes de France, Jean-Pierre Merat, invited her to exhibit her work at the Society’s Exhibition at Fontenay, France. Penny’s favourite medium is normally pastels but now living between the U.K and France she now paints in Oils and Acrylics. .